What’s most striking about Paweł Pawlikowski’s Ida is how it’s shot and presented. Yes, it is in black-and-white in a 1.33 (fullscreen) aspect ratio, but how this limited space is used is even more fascinating. Pawlikowski seems to be shooting the background with more concern than the foreground, and when characters happen to be conversing, it’s at the bottom of the screen, as if they are fighting for space. Our director/co-writer is less interested about creating events for us to watch than he is with simply showing them. There isn’t a moment within where it feels like there is anything less than complete control over everything, from the contained acting to the 82 minute runtime which feels much more sprawling, every second calculated and fixed, like the static shots that make up a majority of the movie. The year is 1962. The location is Poland. 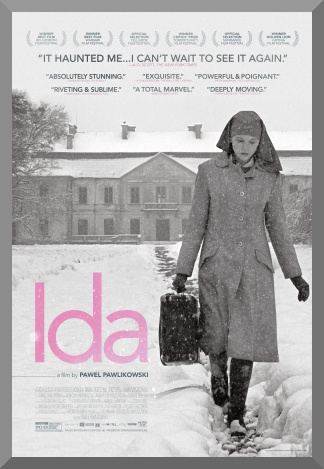 Ida (Agata Trzebuchowska) is an eighteen year old about-to-be nun. She leaves the convent to visit her family, a requirement before officially claiming her new position. She meets up with her aunt, Wanda (Agata Kulesza), a former prosecutor with quite the reputation, having sent several men to the chair. The reason that Ida travels home is to have a deeper understanding about her family’s and her history in order to properly engage in her future. The truth Wanda tells, as one of Ida’s only living relatives, is far more complex and horrific than initially imagined, and as such begins the unraveling of far greater events and consequences. Despite running at just under an hour and a half, Ida feels like it goes on for days. This is not a criticism by any means, because we have the kind of story and kind of movie that needs to move at its own rate, establishing plot points as it goes along. It’s not as much about it being short as the fact that it just so happens that the movie only needs a little bit of your time. There is more than enough time for Pawlikowski to showcase his actors. This is Trzebuchowska’s first film role, but there’s a remarkable amount of power in her mainly quiet performance. Kulesza instills her character with a bit more confidence, and a different kind of personality in many respects. As for a supporting cast, we mostly have characters that come in and out from scene to scene; there really isn’t anyone that sticks, with the notable exception being Lis (Dawid Ogrodnik), a twentysomething saxophonist who hitches a ride with Wanda and Ida when they are driving into town towards the start of the film. I’ve devoted quite a bit of description already to the haunting, wondrous photography on display here from Pawlikowski and cinematographers Lukasz Zal and Ryszard Lenczewski, and that is because it deserves as much as I can write about it. The images stick in your head long after the movie ends. And this isn’t meant to be a complaint against any other aspect of Ida, but some of the imagery soon becomes all of what you remember. While the event itself never occurs in your mind, there seems to be a growing dread when viewing Ida, that its style has come this close to outdoing the story’s ability to create a fully realized substance. You stare intently when this happens, eyes glued to the screen, picking up every single plot detail that you can find. Because you don’t want Ida to be a failure in your mind. You can’t let it – what’s happened before now within is too good, too promising, too enveloping to let Pawlikowski’s fort be seized. Thankfully, the story is just strong enough not to be overpowered. You may go on. But it was a little too close for comfort. Ida doesn’t really end. It just finds a place where it feels that enough has been done, and so it stops. This is not an unsatisfying stop or a sudden one, but here is a movie that doesn’t adhere to the idea of trying to wrap everything up in an obvious bow. When the screen cuts to black, we are still thinking, thinking about the characters, thinking about the story, thinking about our own thoughts. Pawlikowski has done much good here, with talented actors, an absorbing aesthetic, and as a result, crafted a film that certainly has moments of great beauty. They may not be able to translate over to the rest of the product, but it is by no means wasted time. As much about its titular character as it is her aunt, Ida is a good movie, interesting in its examination about discovering yesterday, dealing with today, and how they affect tomorrow.